1. O blessed Joseph, happy man, whose privilege it was not only to see and hear God ...but also to carry him in your arms and kiss him, to clothe him and watch over him! This prayer, which priests once used to recite as they prepared to celebrate Holy Mass, helps us to understand more deeply the meaning of the liturgy for today’s solemnity. Today we contemplate Joseph, husband of the Blessed Virgin, protector of the Incarnate Word, a man of daily work, steward of the great mystery of salvation. It is precisely this last aspect which is given great emphasis in the biblical readings proclaimed a few moments ago, which explain to us how God involved St Joseph in the saving plan of the Incarnation. “God so loved the world that he gave his only Son, that whoever believes in him should not perish but have eternal life” (Jn 3:16). This is the incomparable gift of salvation; this is the work of Redemption. Like Mary, Joseph also believed in the Lord’s word and came to share in it. Like Mary, he believed that this divine plan would be fulfilled through their willing co-operation. And this is what happened: the eternal Son of God became man in the Virgin Mother’s womb. About Jesus — a newborn, then a boy, an adolescent, a young man, a mature adult — the eternal Father spoke the words of prophetic announcement which we heard in the first reading: “I will be his father, and he shall be my son” (cf. 2 Sm 7:14). In the eyes of those living in Bethlehem, Nazareth and Jerusalem, Joseph was Jesus’ father. And the carpenter of Nazareth realizes that in a way this is so. He knows it, because he believes in the fatherhood of God and is aware of being called, to a certain extent, to share in it (cf. Eph 3:14-15). 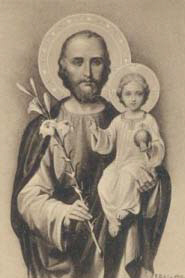 And today the Church, in venerating St Joseph, praises his faith and total docility to the divine will. 2. This year I have chosen the Solemnity of St Joseph for the episcopal ordination of three priests to whom I am particularly close because of their exceptional service to the Holy See and to me personally. They are Mons. James Harvey, Mons. Stanislaw Dziwisz and Mons. Piero Marini. Now in the prayerful and solemn atmosphere of this basilica, they are waiting for the imposition of hands, after the singing of the Veni Creator in which we together invoked an abundance of the Paraclete’s gifts upon them. They are waiting, drawing from today’s Solemnity of St Joseph sentiments and thoughts to reflect upon which will help deepen their understanding of the profound meaning of what the Church is about to transmit to them through these sacramental signs. These words echo in my heart: “God so loved the world that he gave his only Son, that whoever believes in him should not perish but have eternal life” (Jn 3:16). Dear Brothers, who are about to be raised to the grace of the Episcopate, this mystery of love is set before your eyes today with extraordinary eloquence. You are called to share in it in an even more demanding way. God calls you to be his closest co-workers in the universal plan of salvation. To you he entrusts his own Son, who lives in the Church as once he lived in the house at Nazareth. To you he entrusts the Saviour of the world and his saving work. In your youth, the Lord conferred on you, by the grace of the priesthood, a specific ministry in the Church. Today, in your human maturity, you are given through the Holy Spirit a share in the fullness of the sacrament of Orders, by which you are committed in a new way and with greater responsibility to the service of the Redeemer of man, the one supreme Mediator and Pastor of souls. The Church prays with you and for you, so that this mission may become a source of countless benefits for all those to whom you will be sent. We ask this through the intercession of St Joseph; to him we entrust your ministry, mindful that in the fullness of time the heavenly Father put his own Son and the Virgin Mother under his protection. May St Joseph obtain for you an abundant outpouring of the Holy Spirit. 3. It is the Spirit of the Lord who consecrates you with the strength of his love. He consecrates you, dear Mons. James Harvey, of the Archdiocese of Milwaukee in the United States, for many years my faithful collaborator in the Secretariat of State. Now, as Prefect of the Papal Household, you will be responsible for the daily round of audiences and meetings. This is a most significant and valuable service, especially in these years leading up to the Great Jubilee of the Year 2000. It was 35 years ago, dear Mons. Stanislaw Dziwisz, that I ordained you a priest in the cathedral at Wawel. Three years later I appointed you my chaplain. Since the beginning of my Pontificate you have stood faithfully by my side as secretary, sharing the works and joys, the anxieties and hopes connected with the Petrine ministry. I joyfully praise the Holy Spirit, who through my hands will consecrate you a Bishop. With the wealth of your experience, as Adjunct Prefect of the Papal Household you will be able to assist all those who, by reason of their ministry or as pilgrims, come to the Successor of Peter. The Spirit consecrates you, dear Mons. Piero Marini, from the Diocese of Piacenza-Bobbio, for many years my Master of Liturgical Celebrations. In this capacity you have been beside me at the most sacred moments and have always performed with appreciated devotion the liturgical task I entrusted to you, by accompanying me faithfully wherever the Petrine ministry has taken me. The episcopal character will only perfect your sensitivity and your zeal for the glory of God and the spiritual edification of the faithful. 4. Dear Brothers, James, Stanislaw and Piero, on the day of your consecration may a superabundance of divine grace descend upon you. Today, through St Joseph’s intercession, you are spiritually welcomed, so to speak, into the home at Nazareth, to share in the Holy Family’s life. Like Joseph, may you faithfully serve those whom the Lord will entrust to each of you in the Church and particularly in the context of the Apostolic See. “O blessed Joseph, happy man, whose privilege it was not only to see and hear God, ... but also to carry him in your arms and kiss him, to clothe him and watch over him”, to you, St Joseph, silent and faithful servant of the Lord, we commend these Brothers and their new episcopal ministry. Help them, protect them, comfort them together with Mary, your Spouse and the Virgin Mother of the Redeemer.